assigning to service engineers, taking feedback/reports from engineers & ensure satisfactory closure of calls, chasing. She has to prepare MIS reports & warranty claims on daily/weekly/monthly basis so require expertise in MS-Office (specially in excel formula). Require good selling/convincing skills also. Who can join within 1 week. Salary Range from Rs.7000 to 12000/- per month according skills/experience. LULU recruitment at Nattika Trissur - Oct 6 , 2018 - Openings at LULU HYPER MARKET - Looking for a Career With LULU world wide? 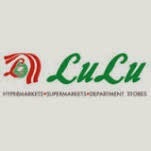 Looking for latest job openings available at LULU hyper markets in UAE and India? Here are some important web portals, emails and phone numbers which may help you in finding suitable career at Lulu..
Lulu founded in 2000 by Mr. M. A. Yousuf Ali, is known for the excellent working environment which they provides for their employees. Lulu have more than 100 retail stores, supermarkets & hypermarkets and are still growing and has over 30,000 employees of different nationalities. There are a large number of people who are living outside India. Among them a good percentage belong to lower or middle income group. This large group of middle-lower income group face many fundamental problems during their life in the Gulf and when they return to their homeland. The saving habits and rehabilitation facilities available to them are also not very promising. Similarly a good percentage of keralites are living outside kerala and within India for their being. These Non-Resident Keralites (NRKs) are also facing similar circumstances as the NRIs.